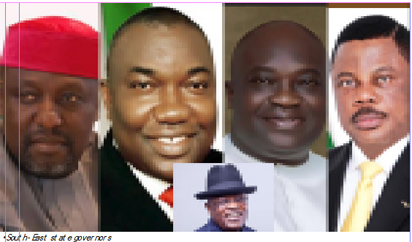 ENUGU—GOVERNORS of the South East region have said that the 2nd Nigeria Bridge has become highly politicised. Addressing newsmen in Enugu, Wednesday, the Director General of South East Governors Forum, Prof Simon Ortuanya said,”the project has indeed become a political chess board in the hands of politicians seeking Igbo votes,” but appealed to the Federal Government to assist the region by ensuring that it is completed. On Enugu Airport, the governors disagreed with the statement by the Federal Airports Authority of Nigeria, FAAN, that the Akanu Ibiam International Airport Enugu was safe for use. The governors had recently raised the alarm that the airport was no longer safe for landing, but FAAN in opposition to the governors claim said the airport was safe.